ww2dbaseThe Automitrailleuse de Combat Renault modèle 1935 cavalry tanks, or AMC 35 cavalry tanks, were Renault's response to a French Army request for tanks that could reach the maximum road speed of 50 kilometers per hour and were immune to anti-tank guns. The prototype was introduced on 7 Mar 1936 as a variant of a prior design, AMC 34; this was done by Renault in hopes that the new prototype would not need to undergo an entire array of acceptance testing. After an investigation, on 9 Mar, the French Army discovered that the AMC 35 prototype was completely different than the AMC 34, thus a complete test program was ordered, thwarting Renault's attempt to speed up the process. The testing completed on 27 Nov and the result deemed the prototype unfit for service due to mechanical unreliability. However, with the German forces now fully occupying Rhineland, orders previously given were not canceled as the French Army felt the pressure to rearm the cavalry branch as quickly as it could; the initial order was for 17 units, and it was later expanded to 50 units. ww2dbaseTo the north, the Belgian Army also placed orders prior to the testing; Belgium ordered 25 units of AMC 34 on 13 Sep 1935, and AMC 35 design was accepted as a variant of the AMC 34 design. However, Renault was unable to deliver. On 3 Jun 1937, Belgian Minister of Defense General Henri Denis requested for an unit for testing, which was delivered on the following day. The test unit was found to have poor climbing capabilities, thus the order was reduced from 25 to 18. In Dec 1937, the entire order was canceled, part of the reason being that some Belgian politicians feared that acquiring offensive weapons such as tanks might provoke Nazi Germany. On 21 Apr 1938, after the French government negotiated with Belgium, Belgium agreed to purchase 35 AMC 35 tanks, 5 sets of reserve parts, and 8 sets of spare armor; the contract was signed on 15 Jun with expected delivery date of 31 Jul. The French Ministry of Defense dictated that for each batch of ten tanks built, the first seven would be delivered to the French Army, and the latter three would be delivered to the Belgian Army. 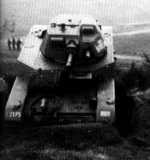 The Belgian models were to be designated A.C.G.1 tanks. ww2dbaseProduction of AMC 35 tanks began in Nov 1938, and progress was slow. The French Army received its first seven units between Nov 1938 and Mar 1939, which means Belgium did not receive its first three tanks until 30 Mar 1939. The French models were equipped with 47-millimeter SA35 L/32 guns as the primary armament, while the Belgian models were equipped with the 47-millimeter FRC guns. The choice of machine guns was also different, with the French opting for the 7.5-millimeter Reibel machine gun and the Belgian 7.65-millimeter Hotchkiss machine gun. Around the same time, surplus AMC 35 turrets were also being completed; 13 of them were installed on French coastal and in-land fortifications as static pillboxes. In Dec 1939, the Belgian Army requested the ordered spared parts to be delivered, and Renault responded that none were available. Production ceased in Jan 1940, shortly after Renault admitted to the Belgian Army that it was unable to deliver the spare parts. By that time, a total of 57 vehicles were built, including prototypes and testing machines; 47 of them were delivered to the French Army, and 10 to the Belgian Army. 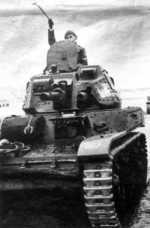 ww2dbaseNot long after AMC 35 production had ceased, the Belgian Army concluded that the engines, transmissions, and suspension systems of its A.C.G.1 tanks suffered from excessive wear just from normal usage. The two tanks in the worst condition were removed from service; one of them was canalized for parts, and the other became a training vehicle. The remaining eight were assigned to an armored car unit that in actuality operated tanks. When Germany invaded Belgium on 10 May 1940, the A.C.G.1 tanks were moved to the front to counter the German forces. Between 17 and 27 May, four of them were destroyed by German 3.7-centimeter PaK guns and two broke down. The two tanks that survived the failed defense surrendered on 28 May. ww2dbaseAlthough the French Army received the majority share of the total production of AMC 35 tanks, it did not assign its 47 tanks to any units. Only on 15 May 1940, after the German invasion of France had started, did the French Army decide to use these tanks. They were assigned the hastily formed units. Experience operating these tanks was generally negative; some crews reported that the tanks were unreliable, and some others noted that the operating off-road range was inadequate. ww2dbaseSeveral AMC 35 tanks were captured by German forces. They were pressed into service under the designation PzKpfw AMC 738 (f), and were all used for training purposes only.